Tom Healey, who is 26, has risen quickly through the ranks to become a shift manager at Euro Car Parts, at a time when the business that has been experiencing 25 per cent year-on-year growth. 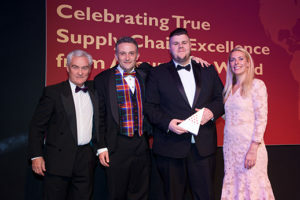 Dave Howorth, director of SCALA Group, Ben Baldwin, Director of Logistics, Euro Car Parts, Tom Healey (winner), Warehouse Shift Manager, Euro Car Parts, and host Sara Pascoe. His inclusiveness and ability to share the vision among his Team has seen a steady stream of improvements, particularly in the areas of safety, fulfilment, timeliness, productivity and staff retention. He has also widened his sphere of influence with the wider business and has regular meetings with the Branch Inventory Planning Team, to ensure that Logistics is prepared and has a voice in aligning the distribution objectives of the business on a weekly basis. The judges felt he was a worthy winner of the Rising Star Award 2017.